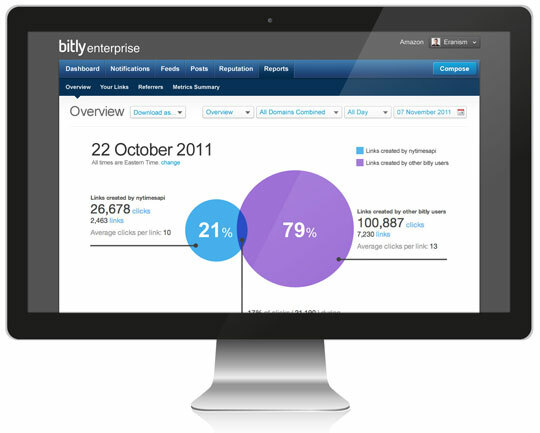 Popular link-shortening service Bit.ly is today announcing the launch of Bitly Enterprise 2.0, a new version of its enterprise-friendly dashboard. The Bitly Enterprise platform, which helps businesses with multiple social media accounts monitor the impacts of their content’s distribution, will now include the first production release of the company’s brand-new search technology, allowing customers to track content around any subject or phrase across the entire social web – not just Twitter and Facebook. This technology is providing access to a new view of the web. The web is no longer just a list of linked pages, but a web of fresh, social and viral content that’s weighted and ranked in real-time, and, in many cases, before Google applies its own PageRank to it. Bitly’s social search engine is able to track the entire Bitly universe, explains CEO Peter Stern, which includes billions of pieces of content, with around 15 million unique pieces from over 100 million shares added daily. When Bitly shortens a URL, it also crawls and classifies the URL. These links form an index of the most viral content on the web, which, through the Enterprise product, allow businesses and brands to see which items (posts, tweets, articles, etc.) are getting attention. The new search technology was originally launched into beta testing in October, with the first part being a sentiment analysis system with alerts. Today’s dashboard update includes that feature, as well as tools for managing multiple accounts (Bitly Composer) and message optimization. The latter lets customers automatically share content at precisely the right time, based on when it will be most relevant to the audience and most likely to drive traffic. (For more details, see Bitly’s blog post). One of the key benefits to the service is that Bitly’s technology doesn’t just track social mentions – it predicts the future, too. For any given search query, Bitly predicts which stories will get the most attention over the next 24 hours. And the company uses its own analytics to make these predictions in real-time. That sort of thing is invaluable to businesses and brands who need to be able to see a shift in sentiment (especially a negative one) before it’s too late. It can also help identify good content that a brand could choose to promote as well as provide ways to view content’s popularity by region, domain or social platform. In truth, Bitly’s social search engine can be understood as being something like a “Google,” but for the social web. Instead of tracking webpages, Bitly tracks topics. And instead of PageRank, it has its own ranking parameters (17 in all), the most critical of which is, of course, clicks. It also tracks where those clicks are from, the platforms being used, the quality of the sources (i.e. organic vs. inorganic sources) and more. “The larger story here,” explains Stern, “…is that we’re taking a view of the web not from a link-based point of view…it’s above link-level, page-level or even domain-level analytics.” It’s a different view of a different web than the one Google sees. What’s most interesting this, is how much of a long tail there is to it. Bitly got its start as the preferred link-shortening service for Twitter (before Twitter launched its own), but the company is no longer limited to tracking Twitter. In fact, Twitter is just 8% of the company’s traffic, and Facebook is just 7%. Today, people are clicking and engaging with Bitly-powered links all over the web. There are over 100,000 in-code sources within applications, for example, plus web-based sharing buttons, links shared in virtual worlds, links shared through texting, within chat, even within games like Minecraft. Says Stern, the company hasn’t yet considered building a consumer-facing service for its social search technology, but it could if there was interest. (YES THERE IS). Given Google’s decision to forgo a realtime search vertical in favor of promotion of in-house content from Google+, it seems that now would be the time for such an offering, if ever. Below, a majorly cool video of Bitly traffic throughout the world, which shows the geographic location of the click and keywords associated with the content. Whoa. Bitly: World Vis (2 / 3) from Micha Gorelick on Vimeo.